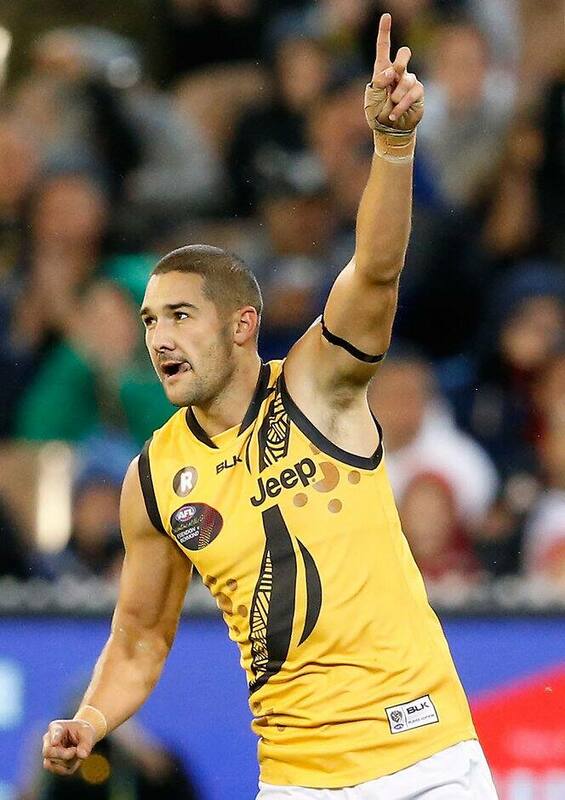 RICHMOND'S revival continues to gather momentum after defeating Essendon by 38 points in their Dreamtime at the 'G clash on Saturday night. In front of 56,948 fans who braved the icy conditions for the showpiece event of the renamed Sir Doug Nicholls Indigenous Round, the Tigers did no more than was required in grinding out a 16.9 (105) to 10.7 (67) victory. After lurching to 1-6, Richmond has won its past three games to remain in the hunt for a fourth successive finals campaign. Meanwhile, the suspension-depleted Bombers are 1-9 after dropping their past eight games. The Tigers' midfield was the difference, proving too prolific and classy for the young Bombers, with the strong efforts coming from best afield Dustin Martin (a career-high 38 possessions), Brett Deledio (23 and three goals), Shane Edwards (26 and a goal), Trent Cotchin (29 and two goals), Brandon Ellis (30) and Shaun Grigg (23 and two goals). Edwards and Deledio were instrumental in setting up the Tigers' early ascendancy – Edwards gathering a game-high 12 touches and a goal in the first term, while Deledio showed no effects of the illness that prevented him from training late in the week, kicking two first-quarter goals and amassing 17 possessions in the first half. Richmond coach Damien Hardwick was happy to bank another win but wasn't entirely satisfied with his team's effort. "We won ugly," Hardwick said post-match. "All credit to Essendon. I thought their pressure was very good – they smashed us in tackles (71-44) and their pressure around the contest was good. "We weren’t overly pleased with our performance but we were good enough to get the four points. "We’ve got some work to do, there’s no doubt about that, but we’re starting to see a little bit of improvement in us, which is really good." Essendon coach John Worsfold, who reached 500 games as a player and coach combined, was pleased that his side embraced the big occasion "a lot better" than it had on Anzac Day. "It wasn't a great start – they had one on the board in 20 seconds, but overall they handled the occasion really well," Worsfold said. "We really fought on and kept coming back at them." Richmond twice threatened to blow the game apart in the first half before Essendon admirably fought back to within striking distance. The Tigers jumped out of the blocks with four of the first five goals to lead by 19 points midway through the opening term, but against the script, the Bombers responded with two quick goals. The Tigers then rattled on the next three goals to extend their advantage to 28 points early in the second quarter before the Bombers again conjured back-to-back goals, with Orazio Fantasia's second major from a set shot after the siren reducing the margin to 16 points at the long break. Richmond ground away to a 41-point lead by three-quarter time before the never-say-die Dons breathed new life into the contest with the first two goals of the final term, before Ty Vickery kicked his third goal, and ultimately the sealer, midway through the final term. As expected, the Bombers were outclassed, but they weren't outworked, bravely continuing to take the game on in a manner best exemplified by youngsters Fantasia and Darcy Parish combining for a terrific goal midway through the third term. This exuberant duo was among the Dons' best performers – Parish (25 disposals and two goals) continuing to push his claims for NAB AFL Rising Star honours in an impressive midfield/forward display, while Fantasia (two goals) was lively in attack. Usual suspects in skipper Brendon Goddard (34) and David Zaharakis (30) led the Bombers strongly, while Zach Merrett and Adam Cooney tried hard, and Courtenay Dempsey proved a quality inclusion across half-back. Essendon: Defender Michael Hartley left the field in the third term with a tight right hamstring and took no further part, and coach Worsfold said he will miss "a couple of weeks". Craig Bird copped a knock in the third term, resulting in a potentially broken nose, but played on. Richmond: David Astbury went off just before half-time clutching his left calf and re-emerged with strapping. Daniel Rioli limped off in the third term with a sore right knee. Richmond encounters league leader North Melbourne on the rebound in the first AFL night game at Blundstone Arena in Hobart on Friday night, while Essendon travels to Perth to take on winless Fremantle on Saturday night.